The entrance to the University of Washington campus from Northeast 40th Street got a makeover and a new name. The stretch between the University Bridge and campus is now called Lincoln Way. WE HAVE INCLUDED a few street scenes that included billboards the past three or four years in this feature. An unnamed photographer working for the Foster and Kleiser Billboard Company recorded all of our selections, most from the 1930s. In this billboard portrait, the centerpiece sign has been stationed perfectly to keep the message directly in the eye of any driver or passenger. The “outdoor medium” boldly plugs the low $815 cost of the latest in four-door, six-passenger 1940 Dodge sedans. Our anonymous photographer is standing beside a trolley safety island on the Northeast 40th Street ramp off the University Bridge. The billboard rests on the northeast corner of 40th, where it jogs just east of 11th Avenue Northeast. The date, March 14, 1940, is typed on a strip of paper taped to the bottom of the negative. For this sunlit Monday afternoon, The Seattle Times reported that the sun that had risen at 6:30 that morning had warmed Seattle to 45 degrees by noon, with winds that quivered between “gentle and moderate.” On the front page the newspaper asked, “When and how will Roosevelt answer the Third Term Question?” That is, when will FDR reveal if he will run November next? He did. The day’s main headline is about the war between Russia and Finland, and whether the United States, France and England will come to the aid of the Finns. They didn’t. For local rail fans, both then and now, the two parallel trolley tracks running on Northeast 40th are reminders that most of Seattle’s half-century-old trolleys would be prepared for scrap before the year was out. Northeast 40th Street had been improved for moving visitors from the Latona Bridge to the Alaska-Yukon-Pacific Exposition, held on the University of Washington campus in 1909. The ramp came in 1918 with the completion of the University-Eastlake Bridge. 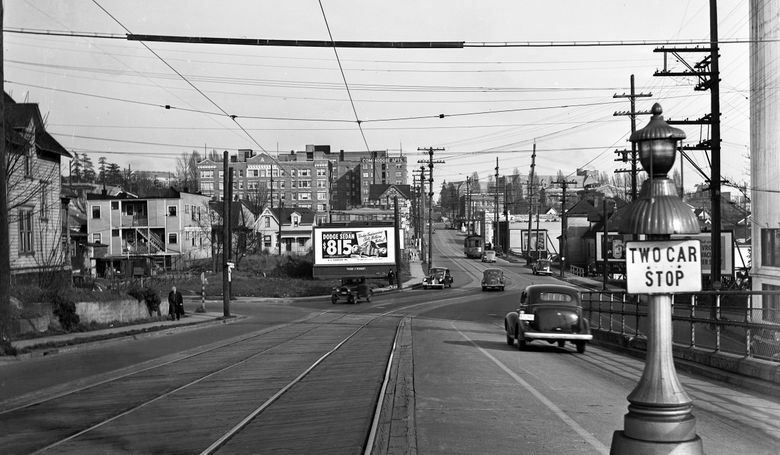 In the early 1940s, University District boosters began their campaign for a new main entrance to the campus, one removed from this somewhat less-than-grand approach on 40th. The result was the nearby Campus Parkway, one small block north of 40th, completed in 1949. 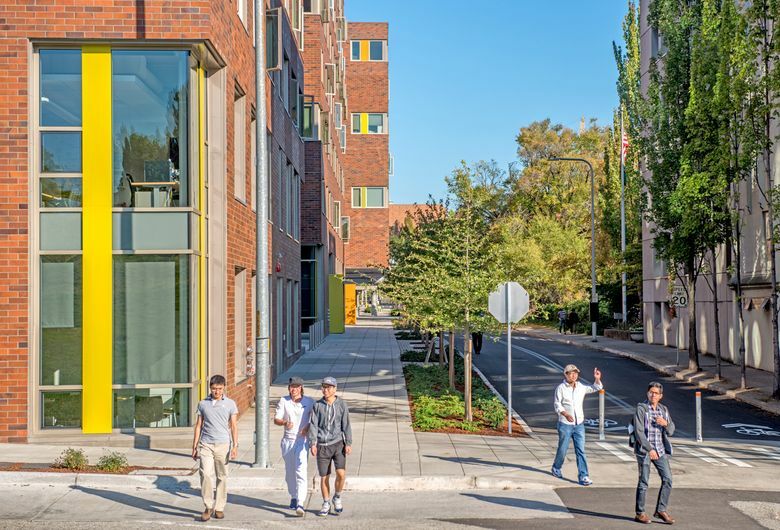 Critics described it as a “five-block-long $845,000 street to nowhere,” and it is true that 40th Street remained the main access to campus.